Welcome to the Adafruit IoT Monthly for the month of April. This newsletter (in blog form) highlights projects and updates about Adafruit IO – our Internet-of-Things Service for makers, news, stories, and advances in the world of IoT. IO News highlights what’s new on Adafruit IO, our internet-of-things service for makers. Adafruit.io has over 15,760+ active users in the last 30 days and over 500+ Adafruit IO Plus subscribers. Sign up for Adafruit IO (for free!) by clicking this link. Ready to upgrade? Click here to read more about Adafruit IO+, our subscription-based service. We don’t have investors and we’re not going to sell your data. When you sign up for Adafruit IO+ you’re supporting the same Adafruit Industries whose hardware and software you already know and love. You help make sure we’re not going anywhere by letting us know we’re on the right track. Sneak Peek: New Adafruit IO API Docs! While our current API documentation works, we’ve been brainstorming ideas to make it better and easier-to-use. Here’s a small list of the features we’re planning on adding: * Easy to Contribute to: While our pre-existing API is public on GitHub, it is not the easiest to contribute to (the v2 HTTP API sits at just over 4000 lines of JSON). The new documentation will be easier to contribute to - it’s all in everyone’s favorite formatting syntax - Markdown! * You can access Adafruit IO’s API over either MQTT or HTTP - we’re adding dedicated documentation pages for both the MQTT and the HTTP APIs. * Writing some code and not sure how to get the last known data value of your feed? Don’t want to read through lines of example code - just need the code? We’ll be including code-snippets for CuRL, Arduino CPP, Python, CircuitPython, and Ruby. 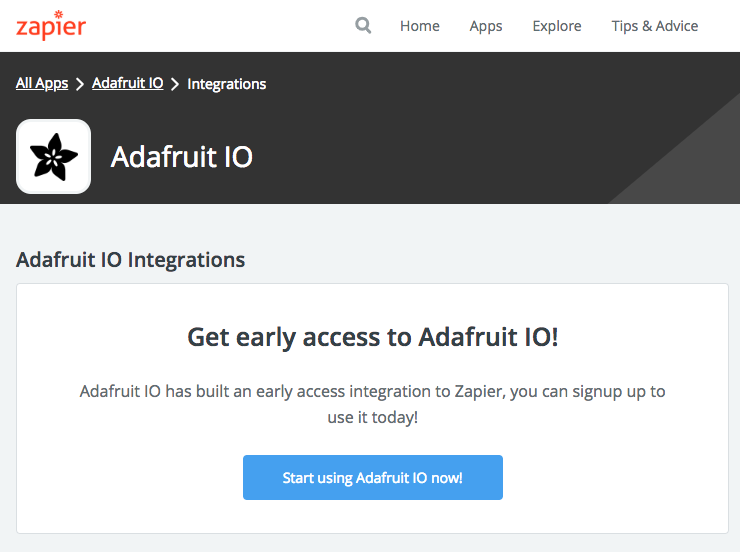 Adafruit IO’s Zapier Integration is now in Early Access! The Adafruit IO Zapier integration is now a public Zapier integration (currently in early-access)! While we’ve made a lot of Adafruit IO projects which use Zapier, people would need to enter a special “invite” URL as we did not have enough people actively using the service and Adafruit IO together. As of today, the “invite” URL is replaced by an official Zapier integrations URL and landing page - https://zapier.com/apps/adafruit-io/integrations. https://www.youtube.com/watch?v=yRqazWCtSgI Want to learn more about Adafruit IO? We’ve released an episode of All The Internet of Things episode featuring Adafruit IO. Hello, and welcome to episode 4 of Adafruit and Digi-Key’s “All the Internet of Things”! A six-part series that covers everything you need to know about IoT. In the previous episode, we discussed services –services are what you use to route events to and from your IoT devices, coordinate real-time communication between multiple devices, and record, process and visualize the data that your “things” are producing. We also talked about some large cloud services such as Amazon AWS IoT, Google Cloud IoT, and Microsoft Azure IoT Suite. You might find that although these services provide robust security and sophisticated deployment tools, getting started with using their comprehensive technology is intimidating. If only there were some IoT service that proved easy to understand and implement…maybe with high quality documentation with examples, learning guides, and community support…and, maybe just maybe, an IoT service that provided opens source solutions with a low to no-cost point of entry… Well, on today’s episode, we’re happy to do a formal introduction to just that – our very own Adafruit IO! We have an interactive learn guide here with accompanying clips and text from the video! If you have a home appliance which you want control over the internet and don’t want to shell out the cost of a smart-plug – this tutorial may be the right choice. 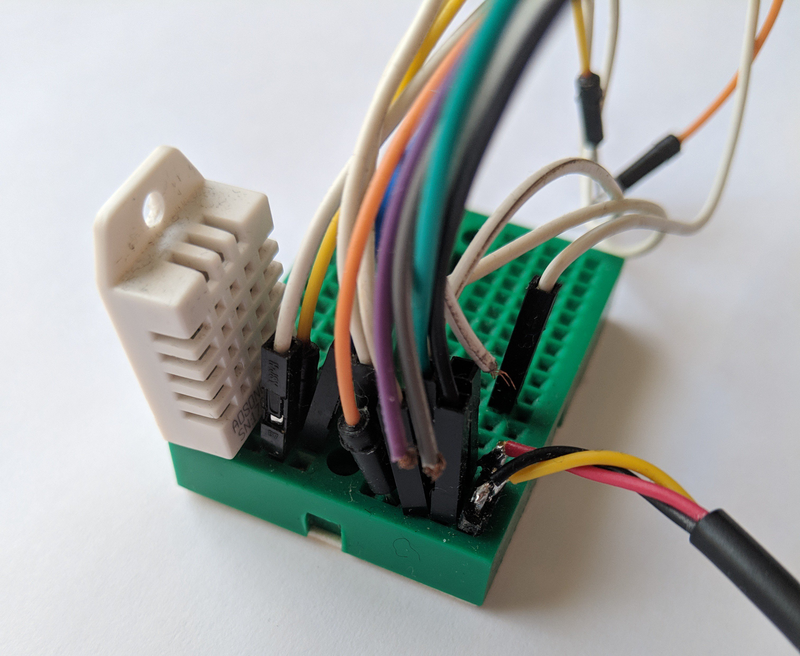 Using an ESP32 module, a relay module and Adafruit IO – you can control any AC home appliance over the internet. This tutorial walks you through the process of wiring the ESP32, setting up Adafruit IO, and creating a dashboard. But, instead of flipping a digital switch – what about controlling the lights using your voice? 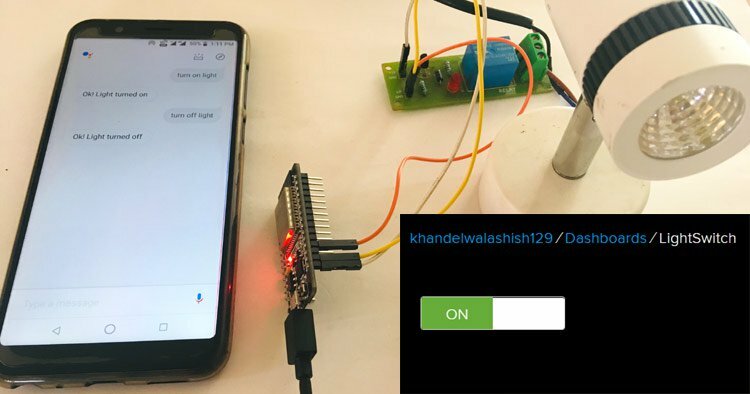 The guide also walks through the process of connecting to Google Assistant using IFTTT (a supported Adafruit IO Integration) and sending voice commands to the light switch. James Bulpin “was looking for a really simple solution to bounce messages via the cloud without all the complexity of a full IoT hub solution” and discovered Adafruit IO. He quickly built a mobile PowerPoint slide controller. If you’re not counting his phone’s web browser displaying an Adafruit IO dashboard, it uses no extra electronics. Instead, he’s running a .NET MQTT client on the same computer to send events to Microsoft Powerpoint. To send data to his computer, he built a drag-and-drop dashboard on Adafruit IO to interact with MQTT feeds. Meeting forecast? Glance at this CircuitPython-Powered PyPortal! 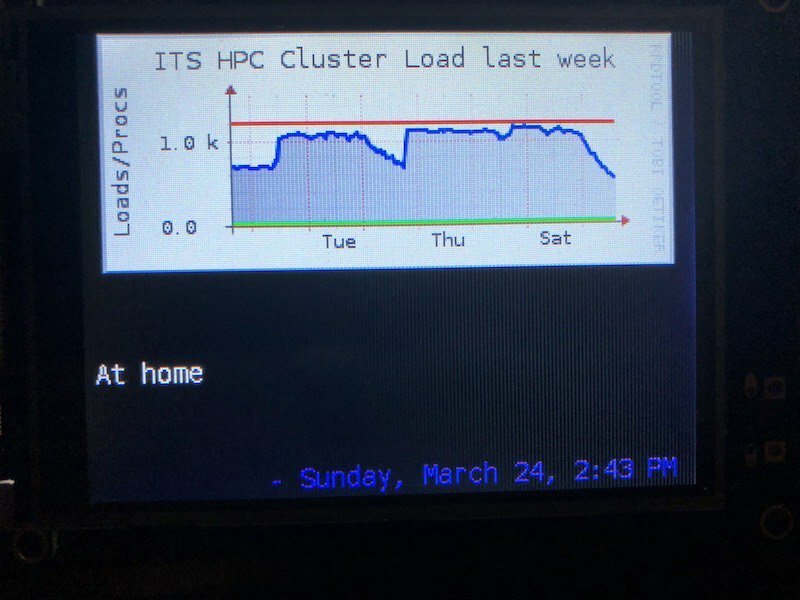 Ronhiltz got his PyPortal up and running – but what to display on the 3.2″ 320 x 240 color TFT internet-connected display? 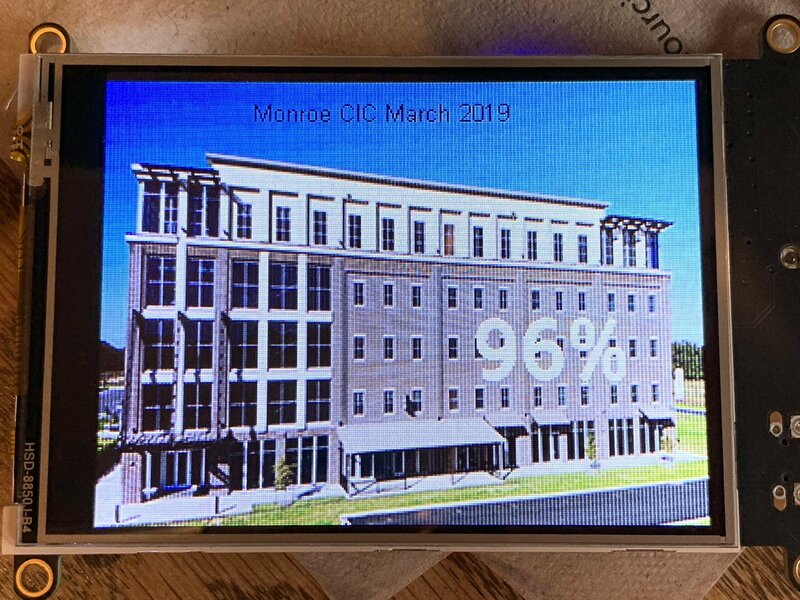 Ron converted a picture of his office into a BMP, created a feed on Adafruit IO, and is using a PyPortal to show how their office is meeting forecast. Great work! With the PyPortal and the CircuitPython Adafruit IO library – it’s never been easier or quicker to create an Internet-connected project! Alexander has been writing a large ESP8266 tutorial series on HackADay.io about the versatile ESP8266. 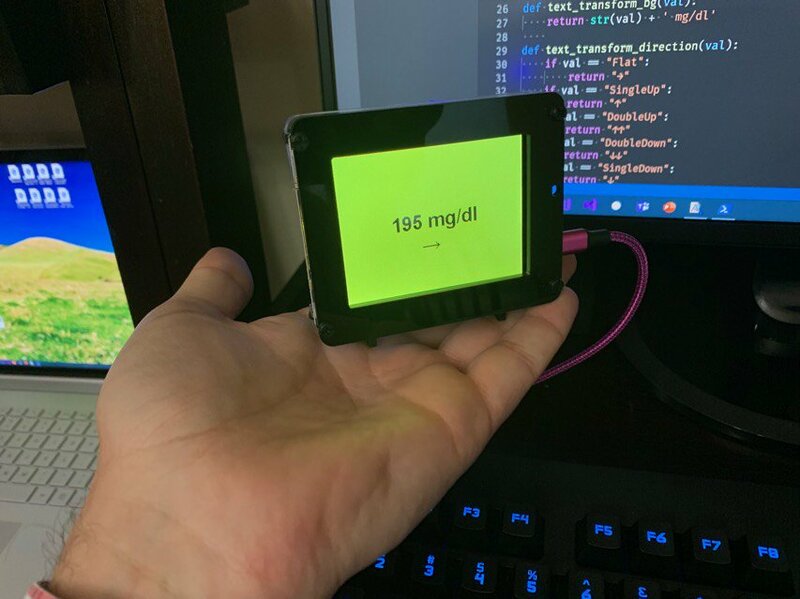 In the third installation of his guide, he walks through the process of sending data from sensors connected to an ESP to an REST API – Adafruit IO. Read more… Are you working on a project which uses Adafruit IO and want to show it off? Add the #adafruitio hashtag to your tweets, join our Discord channel (http://adafru.it/discord, #help-with-adafruit-io), or join the SHOW-AND-TELL every Wednesday night at 7:30pm ET on Google+ Hangouts. If you’re looking to for a way to monitor and send precise motion and temperature data to the cloud, check out this new guide. Analog Devices, known for their reliable and well-documented sensor chips – has a high precision and high resolution temperature sensor – the ADT710 – and a triple-axis accelerometer – the ADT7410. We made a FeatherWing to make these sensors easier to use together. Even better? We can easily bring the FeatherWing online using a Feather ESP8266 HUZZAH and Adafruit IO. 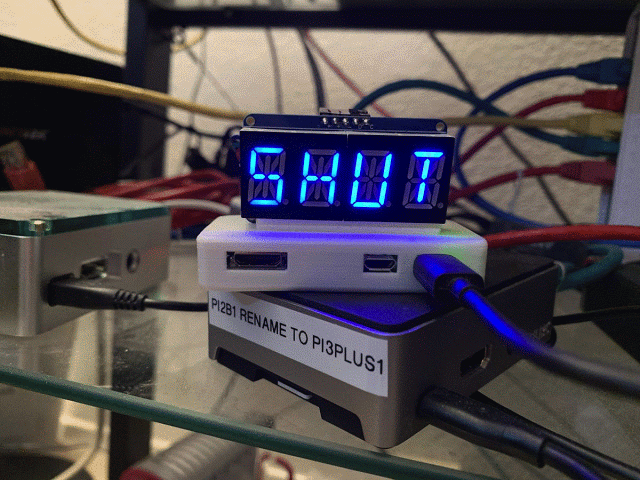 Want to write a message to your PyPortal’s display? Perhaps you’d like to easily add and change text on your PyPortal’s display to use it as a smart sticky-note, or have people email it directly! Using Zapier, you will set up a Zap to receive email via a custom Zapier email address at zapiermail.com and forward it to an Adafruit IO Feed. With some CircuitPython Code, your PyPortal will be obtaining the current value of an Adafruit IO Feed and updating the display with the email sender address and the subject line. 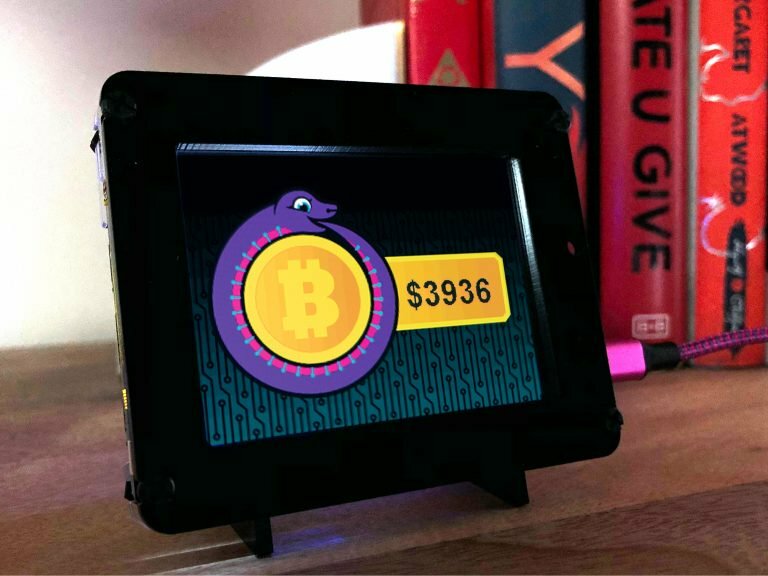 Keep up to date on the current value of Bitcoin or your total wallet value with the PyPortal Bitcoin Display! The simple version of this project will display the current value of Bitcoin in one of three currencies — USD, Euros, or GBP. The slightly more complex version uses a text transform to present the total value of your Bitcoin wallet based upon the current Bitcoin value and number of coins owned. All made in CircuitPython running on the PyPortal accessing the Coindesk API wirelessly! Read more… Join us in the forum or on Discord in the help-with-adafruit-io channel with questions, comments, or suggestions. We’d love to hear from you!